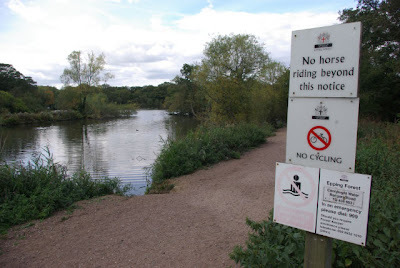 Connaught Water, in Epping Forest, is an ornamental lake which was constructed in 1883, and enlarged in 1893. Originally the site of a marshy pool, the lake is now eight acres and contains some small islands. It was decided to place a lake on the formerly marshy spot in order to drain areas of forest to improve it for Commoners' cattle. The lake is named after the first Ranger of the Forest, the Duke of Connaught, and it is a popular spot for walking and licensed fishing, but also attracts a wide variety of wild fowl, making it popular with bird watchers. For more, see http://www.geograph.org.uk/photo/8101 or to see the location on a map click here.